The minibus taxi is as commonplace in South Africa as the tuk-tuk is in Thailand (although tuk-tuks are now also found on the streets of Jozi, but that’s another story) . They’re everywhere. 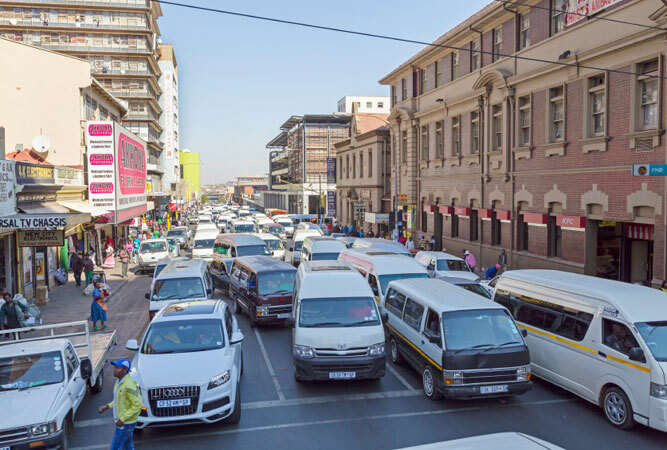 Accommodating roughly 10 people at a time, the average minibus is in dire need of mechanical assistance, and driving standards seldom adhere to the rules of the road – frustrating for everyday commuters (read: those with cars) who regard taxis as a scourge. Many routes are highly unsafe, and as a visitor to the country you would do well to ask for local advice before using them. That said, a visit to South Africa is incomplete unless you’ve hitched a ride in one. In particular routes into the centre of Cape Town, from places like Observatory, Camps Bay, Sea Point, Rondebosch and Claremont, are considered relatively safe. 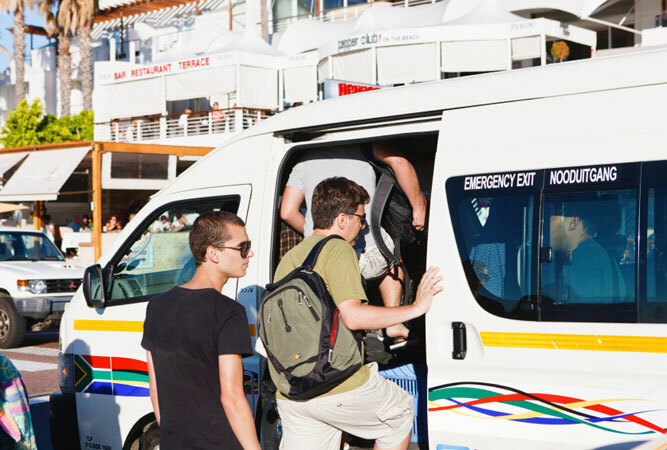 it is easy to catch minibus taxis, particularly on the main routes. People in Cape Town like to shout. Or at least the taxi driver’s gaa’tjie (the guy who leans out of the side window or leaps from the minibus the minute it’s stationary to yell ‘Wynbeeeerg, Cape Town’ at the top of his voice) does. It’s enough to motivate you into a taxi even if you had no intention of doing so. In Cape Town you need to do little other on the major taxi routes (anywhere on Main Road) than stand on the side of the road and raise your hand. A smile will help. Taxis in Cape Town make it easy. They invariably have a handmade destination sign on a piece of cardboard stuck on the minibus’ dashboard so that it’s easy to see. And the average commuter will help you out if you’re lost. Whilst you will have to squeeze in amongst the other, at least, 10 passengers plus the driver (forget the rules), there is nothing terribly complicated about Cape Town’s commuter system. You might want a pair of earplugs to protect your ears against the ear-splitting pump-pump of music that is a fait accompli in most taxis. Routes on which a white face is commonplace are: anywhere along Main Road between the city and Lakeside; Cape Town Station to Camps Bay, Green Point/Sea Point and the V&A Waterfront. You’re not going to get anywhere on the commuter taxi routes if you don’t stick out your hand and signal where you want to go. Every destination has a particular hand sign. Taxi signs used in this way are regarded as South Africa’s 12th official language. Until a few years ago the hand signals of Johannesburg were largely a mystery. Even locals travelling on new or different routes would have to ask other commuters for help. Taxi hand signs were a shared language passed by word of mouth. Then artist Susan Woolf started asking questions, travelling the local routes and speaking to taxi bosses and drivers. She produced the Taxi Hand Sign book as a result. As an artist she has rendered artistic impressions and collated 26 hand signs, connecting them to their various routes. It’s a book that, should you intend commuting by taxi, is a must-have. Over and above these, she compiled another eight signs. These are specifically useful to the blind as they are raised on paper. 10 of all her hand signs (blind and sighted) were chosen for a series of South African standard postage stamp, first published in 2010. If you are at all curious to see them head to your local post office. Prepare to be just about the only white person on board (if, indeed, you are white). There are thousands of minibus taxis in and around Jozi, and they follow their own set of road rules: they stop wherever and whenever they choose, fail to indicate and travel at whatever speed suits them. If you chat to the drivers you will understand that they cannot possibly transport their daily quota of 400 odd people, if they stick to the road rules! They’re quick, cheap and by far the most reliable form of transport in the city for millions of (mostly black) commuters. To get off the taxi, you indicate by raising your fist in the air. You then, on your way out of the taxi pay for your trip plus a 10 to 15 per cent tip. You could also try ‘sho’t right’ (next stop on the right), or ‘after robot’, if the fist thing feels contentious. 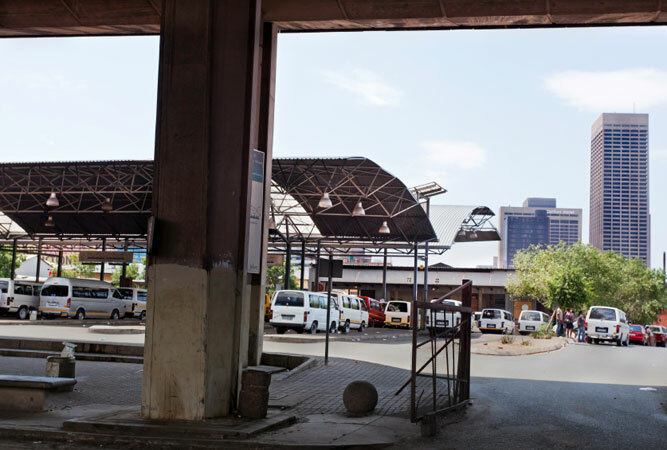 Just about any trip in Johannesburg will involve an initial journey to the centre of Jozi, from where you then catch another taxi to your given destination. But they will stop wherever you need to get out (there are no official taxi stops like there are for buses). One finger up (your forefinger is best) – will get you downtown from anywhere. Forefinger down, pointing at the ground, with the others hooked under your thumb – means travelling local (for instance from Jo’burg CBD to Yeoville), i.e. a short trip. 4 fingers with your thumb folded into your palm – will get you to Fourways. 5 fingers held up, like the number 5 – will get you further north in Johannesburg, like Randburg. Dip your hand up and down in a wave motion – to get to Diepsloot (the roads there are particularly bumpy). There are many more hand signals, all dependent on where you are going and where you are when you hail them.